Neomycin and Polymyxin B Sulfates and Bacitracin Zinc Ophthalmic Ointment USP is a sterile antimicrobial ointment for ophthalmic use. ACTIVES: Neomycin Sulfate (equivalent to 3.5 mg neomycin base), Polymyxin B Sulfate equivalent to 10,000 polymyxin B units, and Bacitracin Zinc equivalent to 400 bacitracin units; INACTIVES: White Petrolatum, Mineral Oil. Bacitracin zinc is the zinc salt of bacitracin, a mixture of related cyclic polypeptides (mainly bacitracin A) produced by the growth of an organism of the licheniformis group of Bacillus subtilis var Tracy. It has a potency of not less than 40 bacitracin units per milligram. 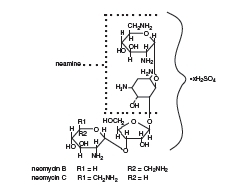 A wide range of antibacterial action is provided by the overlapping spectra of neomycin, polymyxin B sulfate, and bacitracin. Staphylococcus aureus, streptococci including Streptococcus pneumoniae, Escherichia coli, Haemophilus influenzae, Klebsiella-Enterobacter species, Neisseria species, and Pseudomonas aeruginosa. The product does not provide adequate coverage against Serratia marcescens. Neomycin and polymyxin B sulfates and bacitracin zinc ophthalmic ointment is indicated for the topical treatment of superficial infections of the external eye and its adnexa caused by susceptible bacteria. Such infections encompass conjunctivitis, keratitis and keratoconjunctivitis, blepharitis and blepharoconjunctivitis. Neomycin and polymyxin B sulfates and bacitracin zinc ophthalmic ointment is contraindicated in those individuals who have shown hypersensitivity to any of its components. Neomycin and polymyxin B sulfates and bacitracin zinc ophthalmic ointment should never be directly introduced into the anterior chamber of the eye. Ophthalmic ointments may retard corneal wound healing. Topical antibiotics, particularly neomycin sulfate, may cause cutaneous sensitization. A precise incidence of hypersensitivity reactions (primarily skin rash) due to topical antibiotics is not known. The manifestations of sensitization to topical antibiotics are usually itching, reddening, and edema of the conjunctiva and eyelid. A sensitization reaction may manifest simply as a failure to heal. During long-term use of topical antibiotic products, periodic examination for such signs is advisable, and the patient should be told to discontinue the product if they are observed. Symptoms usually subside quickly on withdrawing the medication. Application of products containing these ingredients should be avoided for the patient thereafter (see PRECAUTIONS: General). As with other antibiotic preparations, prolonged use of neomycin and polymyxin B sulfates and bacitracin zinc ophthalmic ointment may result in overgrowth of nonsusceptible organisms including fungi. If superinfection occurs, appropriate measures should be initiated. Bacterial resistance to neomycin and polymyxin B sulfates and bacitracin zinc ophthalmic ointment may also develop. If purulent discharge, inflammation, or pain becomes aggravated, the patient should discontinue use of the medication and consult a physician. Patients should be instructed to avoid allowing the tip of the dispensing container to contact the eye, eyelid, fingers, or any other surface. The use of this product by more than one person may spread infection. If the condition persists or gets worse, or if a rash or allergic reaction develops, the patient should be advised to stop use and consult a physician. Do not use this product if you are allergic to any of the listed ingredients. Long-term studies in animals to evaluate carcinogenic or mutagenic potential have not been conducted with polymyxin B sulfate or bacitracin. Treatment of cultured human lymphocytes in vitro with neomycin increased the frequency of chromosome aberrations at the highest concentration (80 mcg/mL) tested; however, the effects of neomycin on carcinogenesis and mutagenesis in humans are unknown. Polymyxin B has been reported to impair the motility of equine sperm, but its effects on male or female fertility are unknown. No adverse effects on male or female fertility, litter size or survival were observed in rabbits given bacitracin zinc 100 gm/ton of diet. Pregnancy Category C. Animal reproduction studies have not been conducted with neomycin sulfate, polymyxin B sulfate, or bacitracin. It is also not known whether neomycin and polymyxin B sulfates and bacitracin zinc ophthalmic ointment can cause fetal harm when administered to a pregnant woman or can affect reproduction capacity. Neomycin and polymyxin B sulfates and bacitracin zinc ophthalmic ointment should be given to a pregnant woman only if clearly needed. It is not known whether this drug is excreted in human milk. Because many drugs are excreted in human milk, caution should be exercised when neomycin and polymyxin B sulfates and bacitracin zinc ophthalmic ointment is administered to a nursing woman. Adverse reactions have occurred with the anti-infective components of neomycin and polymyxin B sulfates and bacitracin zinc ophthalmic ointment. The exact incidence is not known. Reactions occurring most often are allergic sensitization reactions including itching, swelling, and conjunctival erythema (see WARNINGS). More serious hypersensitivity reactions, including anaphylaxis, have been reported rarely. Neomycin and Polymyxin B Sulfates and Bacitracin Zinc Ophthalmic Ointment USP 21695-192-35 is supplied in a 3.5 g tube with an ophthalmic tip. Store between 15° - 30°C (59°- 86°F).